Discover all that Cebu has to offer with Diplomat Hotel as a base. The 100 guestrooms at this 3-star hotel provide all the essential amenities needed by the business and leisure traveler. Each guestroom has non smoking rooms, air conditioning, desk, internet access (wireless), internet access, in room safe, television. 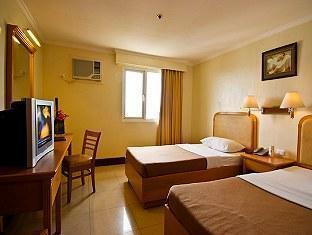 The basic amenities provided at this Cebu accommodation comprise elevator, coffee shop, laundry service/dry cleaning, meeting facilities, restaurant, room service, safety deposit boxes, disabled facilities. The Diplomat Hotel offers massage, spa to provide extra pleasure and relaxation for all guests. The Diplomat Hotel provides a warm and welcoming service of international standard. To proceed with your booking at the Diplomat Hotel, simply choose your travel dates and fill in our secure online reservation form.